Pallet delivery to Austria has never been as straightforward as it is with National Pallets. Whether you’re sending a small item or a large piece of machinery, we can provide you with a safe and secure pallet delivery service to and from Austria. Today, Austria is a parliamentary representative democracy comprising nine federal states. The capital and largest city, with a population exceeding 1.7 million, is Vienna. Austria is one of the richest countries in the world, with a nominal per capita GDP of $46,330. Since Austria became a member state of the European Union, it has gained closer ties to other EU economies, reducing its economic dependence on Germany. Having said that, German influences can still be seen throughout the country including the official language and their transport system, which features the highly efficient Autobahns. Your pallet is treated as though shipped within the UK and therefore requires no extra documentation or customs charges. With selected services from the UK taking as little as 2 days, pallet delivery to Austria on a deadline is easily possible. Plus, using our consignment tracking facility, you can track the pallet all the way to delivery. 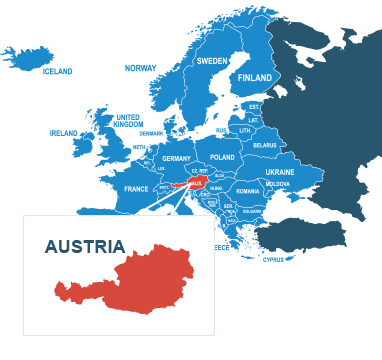 Why not request a free online quote and see for yourself just how easy it is to send a pallet to Austria? Do I need to deal with customs when shipping a pallet from the UK to Austria? No. As Austria is part of the European Union, your pallet delivery is treated the same as if you were sending within the UK, so you don’t need to deal with international customs when sending your pallet. How much does it cost to send a pallet from the UK to Austria? Orders must be placed before 11am if importing or exporting to Austria to qualify for quoted time scales. Standard delivery time to Austria is 5 days, however, express delivery is available on a 4-day service. We can ship the majority of goods to and from Austria, however there are some exclusions, these are listed below.